We have been traveling with a portable oral irrigator for a few years now. It takes up a tiny amount of luggage space and doesn’t weight much. We are firm believers in caring for our teeth and owned a WaterPic for years before we started traveling. We have seen too many of our friends go through expensive and painful oral surgery and are convinced that using an oral irrigator helps in the prevention of gum disease. Research seems to agree. We were thrilled to find this portable device that is easy to use and is compact and light enough to travel with. It charges via USB, so you can use your smartphone wall charger or laptop USB port to charge it and the battery lasts us for weeks. 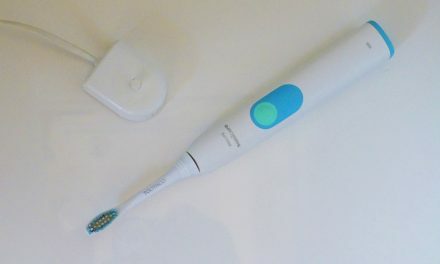 We were shocked to see how much gunk rinsed out of our mouths using an oral irrigator, even just after brushing! We find it easier and more effective than flossing. 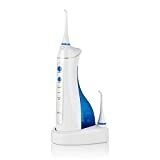 PECHAM cordless professional rechargeable oral irrigator is ideal for those who don’t like to floss. It is an easy and effective way to support proper teeth and gum health at home or away. It is a more effective and comfortable alternative to string floss producing deep cleaning that floss simply can’t provide. Water flossing for about a minute a day removes up to 99.9% of plaque from treated areas and gently massages the gums to improve overall oral health. More effective in eliminating the surface stains and slit between the teeth. 360° rotating nozzle provides deeply cleaning for cavity prevention, plaque control, tartar control, whitening, gum care, and sensitivity relief. Includes 4 detachable, 360°rotating nozzles (2 nozzles with silicone for dental implants and tooth-sensitive people). The USB cable is compatible with any USB charger interface as long as the Voltage is 5V. 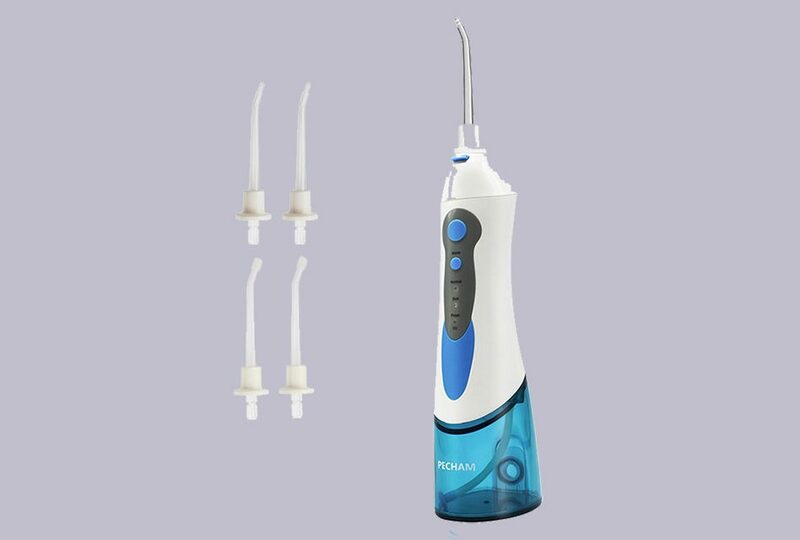 The cordless, USB rechargeable design of PECHAM oral irrigator lets you walk away from the charger for maximum mobility and convenience. Build-in Li-ion rechargeable batteries have more power and longer battery life – up to 2 weeks. Never worry about batteries running out. Simply recharge the unit between uses. Universal USB charging cable is included (charger adapter not included). Avoids electric leakage and enhances safety. Worry free and easy to clean. You can even use it in the shower! Normal powerful, Soft and Pulse to meet various oral care needs, massage gums and make teeth stronger. Please Note: first time users, please choose the soft mode, until you adapt, then use the other modes you desire. Water pressure from 40-90psi with 1700 pulses per minute. Powerful water jet helps remove up to 99.9% of plaque from treated areas, promotes a cleaner mouth and prevents bad breath. Portable design is easy to store at home and office and convenient to travel with. Large water tank has a capacity of 180ml for complete cleaning.